Happy Thursday! This week, Kerry issued a pretty simply Challenge for Three Clover Thursday - use Black & White and one other color. I combined two of my favorites for this weeks challenge, the Baroque Motifs Flourish, and the Paper Tole Rose using Fifth Avenue Floral. I think the flourish looks great peeking out from behind the rose. To see what Kerry's Blog and the other Three Cover Challenge Team created, click the logo on my sidebar. Have a great day! 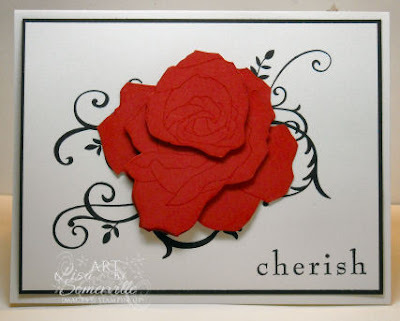 I agree Lisa, the Flourish is gorgeous but that rose is Stunning. Lisa, this is simply stunning! What a wonderful design, Lisa! Thanks for the inspiration! Great card Lisa. Nice job with the challenge. WOW. I love your cards. They will be a real gift to somelucky person. Just lovely. This is so pretty. Love the red rose on the black and white background. Wow. I just saw this and WOW! I so love it! !